Juicy Stakes is giving 25% cash back on busted deposits most weekdays this month, but over the Easter Weekend players that make a deposit but don't win at slots can get 35% of that deposit refunded. 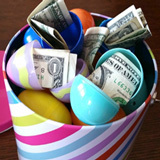 35% Easter Cash Back is available April 13th to 16th only. 25% Cash Back is available April 11-12, 17th - 21st and 24th - 28th. 35% refund available on busted deposits April 13-16, 2017. Juicy Stakes, which welcomes players from all over the world, hosts one of the busiest poker rooms on the Horizon Poker Network but it also has a selection of high definition wide-screen slots from Worldmatch Games as well as table games like Blackjack and Roulette and video poker. One of the most popular games right now is Sugar Rush HD, a candilicious slot game that’s perfect for players daydreaming about baskets of Easter sweets.